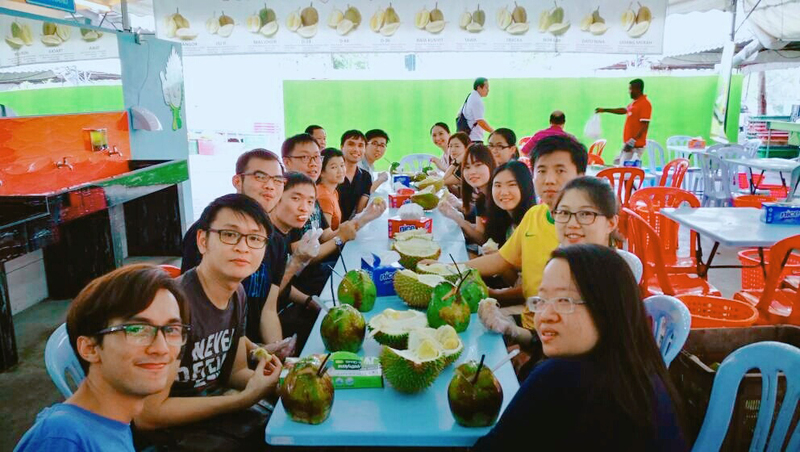 Durian outing with the Team at a famous local stall—weird taste but memorable time spent together! First of all, I’d like to thank XiMnet Malaysia for all their help, both within work and beyond, throughout the past two months. It is thanks to them that I have now successfully completed my internship abroad. As someone who had never travelled alone before, choosing to undergo the entirety of my internship as a foreigner in Malaysia was quite a leap for me. However, thanks to the hospitality of AIESEC and the people at the office, I felt right at home. Initially I was nervous, feeling uneasy as I stepped into the office for the first time. My tensions soon dissipated as an ice-breaking meeting was held, during which I received a warm welcome and was introduced to the entire XiMnet team. I’d like to give special thanks to Yap, who instructed me and gave me hands-on guidance on the projects I was tasked with over the duration of my internship. Through my work in the small XTOPIA office, I was able experience a sense of accomplishment that I had never experienced before. While interning at this company, I was also able to enjoy a great variety of out-of-work activities with the people at XiMnet. We ate durian, played badminton and table tennis after work, giggled through our lunch breaks, attempted both the “paper” the “bread” challenge, celebrated our birthdays and much more, together. But what moved me most was the red envelopes, given to me by colleagues, and the "Gong Xi Fa Cai" they wished me from their hearts during the Chinese New Year. It is no exaggeration to say that, even as a Chinese person, I have not received such formal blessings in the past five years. When I entered the office and saw the red envelopes placed on my desk, I felt extremely excited. On a separate note, I am thankful to my boss for his sincere advice on my Spring Festival trip. After he recommended it, I immediately booked a ticket to Langkawi and spent the Spring Festival by the seaside for the first time, experiencing the unique splendors of the tropical rain forest, the ocean and the intoxicating Malaysian charm. Looking back on my time at XiMnet, I particularly liked the warm environment, the lovely people, and the company-held activities promoting solidarity and friendship. I deeply regret falling ill so frequently, but I hope that I was able to make a modest contribution through my work in these two months. I wish upon the people at the company good health, career success, family harmony, and all the best in the new year. I know that the experience of undergoing my internship at XiMnet Malaysia will not only be a happy memory for me, but also play an important role in my life as my career develops. I hope that I can return in the near future! "Real change is difficult at the beginning, but gorgeous at the end. Change begins the moment you get the courage and step outside your comfort zone; change begins at the end of your comfort zone."